1. How was this year? 2. Was this year better or worse than last year? How come? This year was much better than last year. 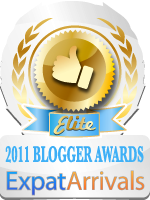 I made some drastic changes in my life (stuff I don't blog about!... and you thought you knew everything..lol). The changes made me a better person, I gained confidence and I found out some things about myself that I didn't know about before (but people would point out - I never believed them until now). 3. What was the happiest thing for you this year? Seeing my son Ibrahim make huge progress in his school life and behaviour. 4. What was the saddest thing for you this year? Deaths of friends and family. 5. What was the toughest thing for you this year? So far I managed to achieve what I set out to do. At the time some things seemed very difficult but when I struggled through and found that in the end nothing seemed that tough afterall. At the beginning of the year I was rearranging things both at work and in freindships. That was hard and stressful, but I came through. 6. What was the best movie for you this year? I don't watch many movies - but I had a good laugh watching Borat. So funny! 7. What was the best music for you this year? A friend of mine suggested Vassilis Saleas, a Greek clarinetist. Having spent nine years of my childhood playing clarinet I really appreciated the mastery of this wonderful musician. 8. What was the best TV show for you this year? Nope... never bother to waste my time on television. 9. What was the best place you visited this year? Nalut - being invited to attend Nalut's annual festival last April was an honor I will never forget. 10. What was the best food you had this year? Pizza in Malta with Tara. Pizza Hut delivered to our hotel and we had a feast! I saved some in the mini bar's fridge to eat the next day and it was even great cold for breakfast. 11. What was the best restaurant you went to this year? In Malta Tara and I went with some friends to a small sidewalk cafe. We leisurely people-watched, enjoyed the weather and had a nice time. 12. What was the most useful thing you bought this year? My laptop. I don't know how I managed without it in the past. 13. What was the most expensive thing you bought this year? Again.. that would be my laptop. 14. What was the best item of clothing you bought this year? For dressing up it would be the outfit I got to wear to my friend's daughter's wedding. For everyday it would have to be a jean skirt that is really comfortable. 15. What was the biggest waste of money this year? I'm pretty frugal when it comes to most things. I think things out before buying anything. The thing I wasted most on was probably junk food - both for myself and the kids. It's so much easier to stop and buy fast food on the way home from work to eat for dinner - I feel tired by the end of the day and never want to come home to go straight in the kitchen. But the cost adds up, especially if you are feeding eight. 17. Do you have any regrets about this year? What are they? Regrets... hmm.. I wish I had gotten to go to the US for a visit to see my family. Hopefully this year. 18. Did you make a New Year's Resolution this year? What is it? No way! I will only give myself a guilt trip if I don't fulfill my New Year's promise. So there you have it. Eighteen questions about my year. Teenagers are driving me crazy! 'Yusef! You get out of my car right now!' I shout. 'But Mom, I'm only sitting in the car listening to music.' he answers back. Lately Yusef has this idea that he can go off in my car for a joy ride every time he sees it parked in front of our building. When he's not riding around in my car he's sitting in it with his cousin listening to music. Yusef has been practicing driving his father's truck around the farm. Two weeks ago, on the second day of Eid he lost control of the truck and drove it into a tree, much to the displeasure of his father. Last night Yusef came in to tell me that he had moved my car in order to wash it and scraped it on the gate. 'It's dark outside Yusef! You never want to wash the car in the daylight. What makes you think I would believe that you would wash the car after dark?' I asked in total disbelief. I'm afraid to go out and look at what he claims is a 'small scrape'. 'Oh, and I knocked my head against the rear-view mirror and it fell off. But it should be easy to fix.' Yusef said sheepishly. How do you knock your head against the rear-view mirror I wondered. Am I supposed to keep my car keys stuffed safely in my bra? How do you beat your son when he towers above you? I hate shouting at the kids... everyone in the neighbourhood can hear. Yusef is downstairs 'fixing' the mirror. I can hear that he has turned on the car. He's revving the engine. I'm gonna kill that boy! If you are wandering about the countryside in Libya and come across this plant... stay away from it. It will cause you to itch and scratch like mad. Eid is over and we're back to a regular schedule today. I've been trying to straighten up the house and get everything organized again. All the pots and pans and other kitchen things we dragged to the farm have been washed and put back in their places. What is killing me is the laundry... piles and piles of it! Eight people create lots of laundry. I've been doing it for the last two days. The poor washing machine is ready to surrender. My plan has been to buy a new one when we move. But of course I thought we would have moved ages and ages ago (like at least a year ago or more) . This morning I took hubby over to the washing machine and pointed out to him that it wasn't going to hold out much longer. Get yourself ready to shell out for a new one soon was my hint for the day. He wanted to know exactly what the problem was... I think he is thinking about hunting down parts for it. The machine has been part of our family for about 12 years. It's surprising that I haven't given it a name. We got to the farm to see the last of the frost on some of the plants. We found a piece of cardboard that had been laying on the grass that was still completely covered in frost, glittering in the morning sunlight. After a while the weather warmed up and Eid went smoothly. This is a first for us - The first Eid by ourselves (in 19 years). We've always done Eid with the entire family. Every year the family seems to get bigger, and noisier, and with that Eid becomes an unpleasant experience. This year we decided it was time to go it alone and it was wonderful. No crabby sister-in-laws or screaming babies, and best of all no brother-in-laws hanging about, so the girls and I could wear what we liked and leave our hair uncovered. Yeah!!!! Hubby and the boys slaughtered the lamb and then we got to work. Nora cleaned out the intestines and stomach and we sent it off to my mother-in-law's house so they could make usban (Libyan sausage). I chopped up meat for the freezer, made igliyah (Libyan fried meat), and sliced up meat and hung it up for drying (gadeed). We stuffed ourselves with grilled meat and we ate macrona umbakbaka too. After we were finished with the meat and everything was cleaned up we took showers and then went to give Eid greetings to my in-laws. I think this is the best first day of Eid we've ever had in Libya. I hope the rest of Eid is just as nice too. It's cold this morning in Tripoli.... 2 degrees Celsius (36F). I didn't sleep well because one of my stupid neighbours left their water pump running all night long. Most likely they forgot to turn it off before leaving for the holiday. It's made a high pitched whining sound all night long. Now because of lack of sleep I have a nasty headache and I feel awful. Have a great day. Eid Mubarak to all who celebrate! Since my last post I've been busy figuring out Second Life and the virtual Hajj. I had to cover my exposed navel or risk getting possibly thrown out. A nice 'sister' pointed me in the direction of some green duffel bags that had all the gear in them you needed for a virtual Hajj. I had to get rid of the sword that I was walking around with too. I donned my hijab and went in to see what it was all about. 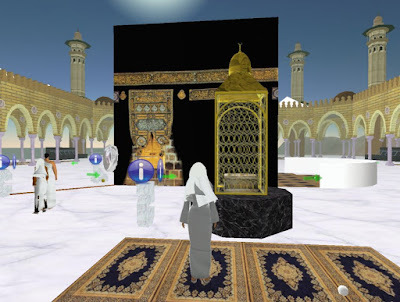 The virtual Hajj is virtually empty! No crowds like in the real one. I went out shopping the other evening, leaving Nora in charge of her father and the house. I'd left the computer on so she could chat with her friends on the net. When I came home I found poor Nora near to tears. Apparently her father had been watching Aljazeera and learnt about a virtual Hajj on Second Life. He made her spend her whole Internet time trying to figure it all out. - Imagine that! My husband actually wanting to do something on the Internet! Is this progress? Nora isn't too Internet savvy so she couldn't figure out how Second Life worked. So I sat down and had a go at it. You've got to join and download a program onto your computer so that you can enter the virtual world of Second Life. After doing this I created my persona. 'How come you didn't choose an Islamic name?' asks hubby. 'Why do I need to have an Islamic name?' was my reply. 'I don't think I need to have a name that associates me with any religion. There is probably discrimination even in a virtual world.' Hubby was also unhappy with my appearance. 'Your navel's showing.' he pointed out. 'That's my business - this is my persona. And guess what. I've decided not to have a husband in my second life.' .... Heheheh... Hubby also wanted to know why everything seemed to move so slowly. 'Ask LTT. It's their fault that the Internet connection is so slow.' was my response. I got busy trying to figure out how to drive a car and fly around and how to make my hair longer. I was taking my time poking about the virtual world. Hubby got bored after a while and decided to go out. A virtual world is an interesting concept. It could be a useful tool for education if used in the right ways. It also has it's dark side.. but then so does the real world. You can't just walk in and have a virtual Hajj either. There's a time schedule with lectures to attend. Life, either virtual or real, is complicated. We went to the house/farm yesterday to see how things were progressing. It was cold and rainy for the most part, but the kids and I took a walk around in between rain showers. Mustafa has recently plowed up all the fields and everything looks clean and neat. The leaves have fallen off of most of the trees but there are a few that have still got green turning to gold leaves on them. The hoses that are used for the drip irrigation system have been rolled up to enable the plows to go through. They'll stay rolled up as long as the rainy weather holds out. The loquat trees are blooming. Their flowers are pretty uninteresting and don't have much aroma. I'm not a huge fan of loquats but as they are easy to grow and their fruit comes out at a time when there isn't much local fruit available. The majority of Libyan farms seem to have at least a few loquat trees. They are pretty much low maintenance as far as trees go - not spectacular, kind of ho hum. On to the house which is progressing very slowly. The fixtures are being installed in the bathrooms. Two of the bathrooms have these god-awful Italian fixtures in them. Mustafa got them from a relative who had come back to Libya from abroad and was going to put them in his flat and then decided to go back abroad. He was all excited to get a good price for them. This is the sink and the bidet - the toilet looks pretty much the same. I think it's weird to relieve yourself in something that looks fancier than the dishes we eat off of. Oh well... I guess we can officially call the toilet 'The Throne' from now on. The rest of the bathrooms have normal fixtures in them... ones that I chose. Plain, easy to clean, and hey... they are functional! This is the growing rubbish pile. It is even visible on Google Earth. I suppose it will grow larger before the building is finished. I took this picture yesterday of Jenna and Ibrahim... as usual Ibrahim has a snotty nose... but I love him anyway. A friend of mine and I were talking a few years ago about how women who migrate to foreign lands to be with their husbands had a kind of pioneer spirit about them. Not everyone is ready to give up the life they know and plunge themselves into a completely different culture to live out their lives. It takes a certain special kind of woman to be able to survive. It's not even necessary to go halfway around the world to do that. I've spoken to women from Benghazi who moved to Tripoli to be with their husbands and they go through many of the same changes and feelings even though they are still within their own country. Lately I've been reading this Blog: Confessions of a Pioneer Woman and I am enjoying the similarities of thoughts and feelings. The stories and photography are really great! I'm starting to hear farm noises in my neighbourhood in the city..... Baaaa! Baaaa! Yes, you guessed it... Eid is right around the corner. I am gearing up for it. Taking all of next week off work, hoping to take my mother in law out shopping, gotta sharpen the knives and get the pots and pans ready and of course put up the rope to hang the meat out to dry. The gasoline situation seems to be sorting itself out. Last night I went out to find long, long lines at some of the gas stations in my area and other places were completely closed. I didn't bother to get in line. Today I went out and found the gas stations busier than usual but not too bad - so I got in line and filled up. Sara and I were on the hunt for a winter coat for her to wear. She has a perfectly good, warm brown coat sitting in her closet but the school has decided that they can wear only navy blue or black. We looked high and low and found hardly anything - most were poor quality and wouldn't be warm enough. In one shop I found a man's coat - black, warm, excellent quality and it would fit her. But Sara said 'I am not going to wear a man's coat!'. I bought it anyway figuring either Nora or Yusef would wear it and because the price was right. Of course Nora was delighted with it when she saw it and then Sara decided she wanted one too...sigh... She'll have to get her father to take her for it - I am shopped out for the day. There's a gasoline shortage in Tripoli. That's hard to believe since Libya is an oil producing country. But it's true. The gas stations have no gasoline, though there is diesel. Rumors are flying as to what's going on. All I know is that I have about a quarter of a tank of gas in my car and it's my day off. I'm not going anywhere because I fear if I use my gasoline I will be walking to work next week. Isn't the Ghat Festival coming up? They never advertise these things and you don't find out about them until after they are over. I know it's sometime the end of December... anyone know when? I want to go. I'm developing a cough.... It seems everyone around me is sniffling, coughing and sneezing. I just made it through the flu - I don't need to be sick again. Lemon and ginger tea to the rescue! It tastes disgusting and burns your throat as it goes down... but it usually works!